Hair Salon Columbia Md / It’s True. Only Her Stylist Knows For Sure! | Best Salon and Spa in Columbia MD! Hair Salon Columbia Md / It’s True. Only Her Stylist Knows For Sure! It’s True. Only Her Stylist Knows For Sure! Many years ago, there was a TV ad for hair color. The parting line was, “Maybe she was born with it.” Well, today that question takes on a whole new meaning. And we’re not talking just about color! Whatever the reason, hair extensions are so natural looking no one ever has to know except your stylist. How can we make such a bold statement? We’ve been trained and certified to do hair extensions. Never, ever allow a stylist to add extensions to your hair that hasn’t received proper training! We also only use the best quality hair extensions for our clients, matching texture and color for an exact match. So yes, our quality and skill is that good. You are in extremely capable hands with us. We love what we do! It’s not just our job, it’s our passion for you to have the style and look you truly desire. Ask us about a complimentary consult today! 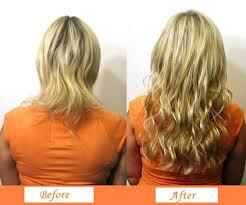 If you want your hair to have the Hair Extension look, it’s what we do best at Vivid Salon located in Columbia Md. !